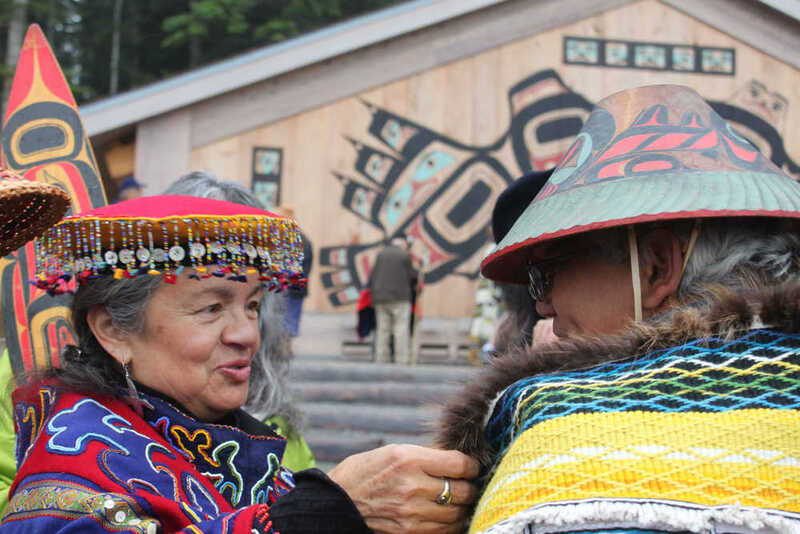 The Weavers Across the Waters Robe was the first ceremonial robe known of to be intentionally contributed to by numerous Chilkat and Ravenstail weavers, spearheaded by the late Tlingit artist and weaver, Clarissa Rizal. 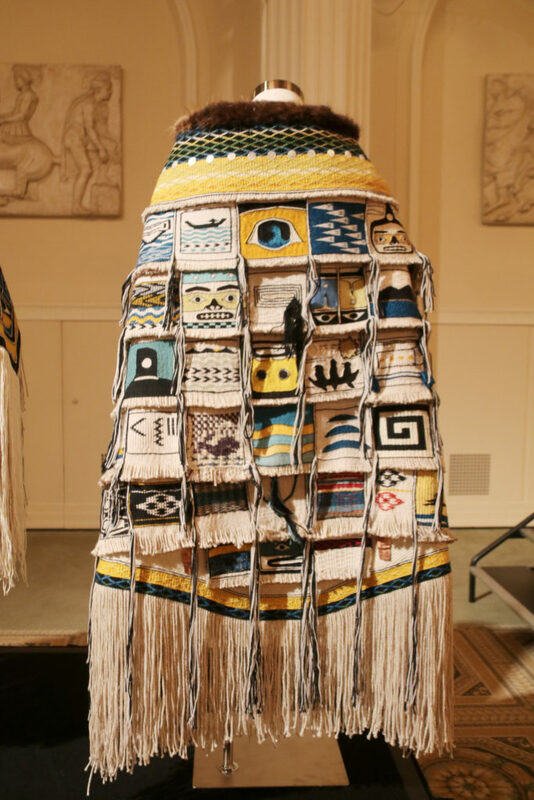 The robe was first danced in the summer of 2016, completed in 2017, and is now housed in the new “Weavers’ Studio” at the Evergreen Longhouse campus in Olympia, Washington. It is to be worn by a dignitaries for NWC Canoe Gatherings and/or also to be worn in ceremonies during the maiden launches of traditional dugout canoes. 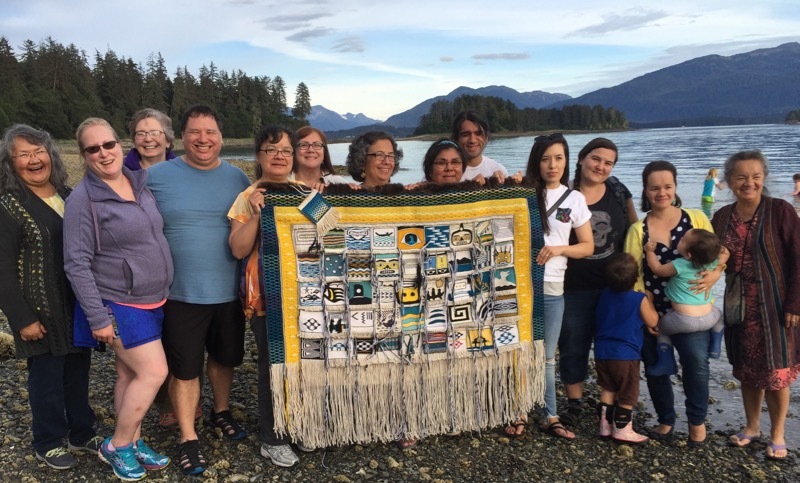 The idea for the collaborative robe was originally conceived by Clarissa and her dear friend and fellow Chilkat weaver, Suzi Williams. Clarissa passed away before the borders of the robe were completed; her daughter, Lily Hope led the completion of the bottom row and bottom border the winter of 2017. 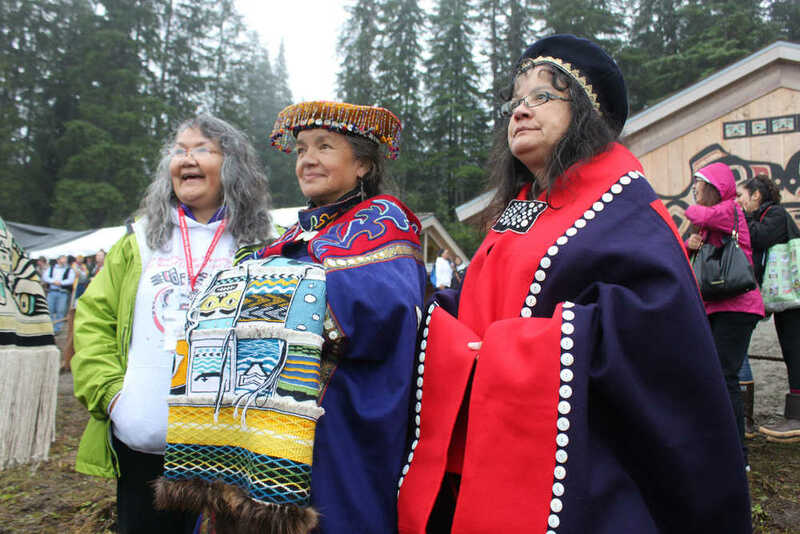 During the robe’s creation, it became clear that collaborative robes such as these do much more for the Chilkat and Ravenstail weaving communities than manifest spectacular works of art; they offer space for self-expression, open dialogue, expanded skillsets, spiritual growth, and an increased sense of community. Spirit Uprising was founded in the wake of Clarissa’s passing by her sister, Deanna Lampe, and her two daughters, Lily Hope and Ursala Hudson. 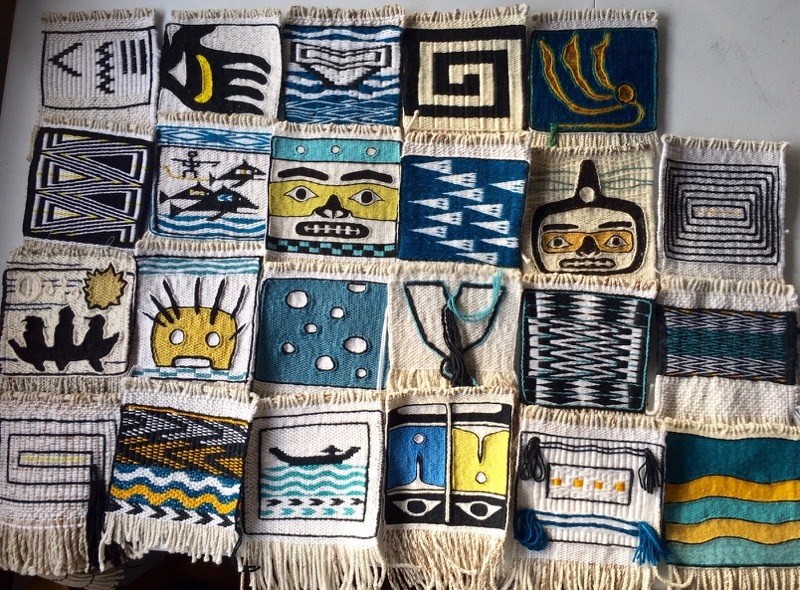 The mission of this organization is to preserve the integrity of Ravenstail and Chilkat weaving by promoting excellence, educating students, and supporting weaver communities internationally. “My goodness, we share in the excitement and most likely all of what I feel too in the completion of this robe! Della Cheney, Suzi Williams, Lily Hope, Vicki Soboleff, Margaret Woods, Veronica Ryan, Catrina Mitchell, Chloe French, Annie Ross, Stephany Andersen, Karen Taug, Dolly Garza, Nila Rinehart, Teahonna James, Ursala Hudson, Edna Lamebull, Courtney Jensen, Sandy Gagnon, Kay Parker, Marilee Petersen, Alfreda Lang, Georgia Bennett, Willie White, Pearl Innes, Koosnei Rainy Kasko, John Beard, Joyce Makua, Michelle Gray, Gabrielle George, Sally Ishikawa, Darlene See, Douglas Gray, Peter McKay, Shgen George, Debra O’Gara, Marsha Hotch, Irene Lampe, Davina Barrill, Yarrow Vaara, Mary Ebona Miller, and Clarissa Rizal. This list of weavers was compiled by Clarissa Rizal prior to the robe’s completion, several months after Clarissa’s death. A few more squares were added to the bottom row upon finishing the robe’s borders. If your name is missing from this list, please contact us and we’ll be sure to add it. Gunalchéesh!